This Professional Grade 5x5 Displayshade Photo booth Canopy with Sidewalls Package by Caravan Canopy is the go to choice for all portable photographers. 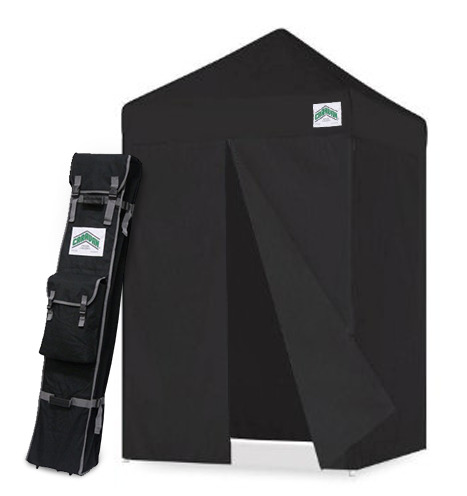 This photo booth canopy features a commercial tough 500 Denier, fire retardant, polyester top as well as a 36 pound, lightweight steel frame construction for all events both indoors and outdoors. With its easy, pop-up design, setting up and breaking down your mobile studio will be a breeze. Color choices include black or white (with matching sidewalls). You can be the professional on the go with this 5x5 Displayshade Photo booth Canopy with Sidewalls package by Caravan Canopy. WARNING: This product can expose you to chemicals including Diethylhexyl Phthalate, which is known to the State of California to cause cancer, birth defects, or other reproductive harm. For more information go to www.P65Warnings.ca.gov. Peak Height is 9.5 Feet. Folded Size: 61.5" x 8" x 8"
Box Dimensions: 63" x 12" x 10"
Comes with Standard 250D Polyester.